I received this email, I don't know who nominated Words For Warriors for this, but my most sincere thanks. My name is Andrea-- I'm contacting you from LetterToASoldier.com. 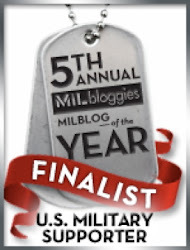 I wanted to let you know that your website (Words For Warriors) has been nominated for our list and has now been approved. Rank on LetterToASoldier.com is based on voting. I have added a button so all of you can improve Words For Warriors Rankings.